LaBelle Wedding Studio - your perfect destination for unique custom made wedding dresses and bridal gowns. 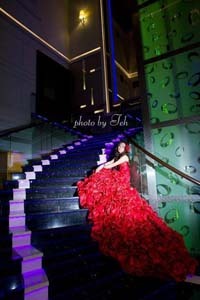 We also craft lovely evening dresses for all occasions. We take special pride with our work. Standards these days are all bout for mass production. Our dresses are not produced, they are crafted - meticulously and lovingly. In fact, we only do custom dresses. La Belle offers avant garde bridal gowns and wedding dresses by keeping updated with the latest fashion trends around the globe. Get creative with what you want. Personalized every aspect of your bridal dress. Style it to match wedding accessories such as earrings, necklace, wedding veils and bridal shoes. 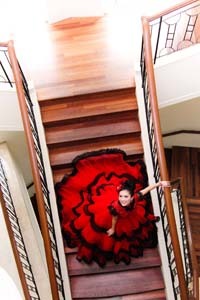 Coordinate your La Belle's custom dress with the planned theme and colors of your wedding night. We'll work closely with you. If you are keeping within a specific budget, we have inexpensive options that you may consider. We take this opportunity to wish you a successsful and fantastic wedding ceremony in the coming future and a blessed, happy marriage. Made to fit only you. Made only once for you. La Belle wedding dresses deliver the challenging goal of combining comfort and luxury to satisfy the most discerning consumer. We believe that whatever design we create, it begins and ends with the body. The La Belle line is diverse; ranging from wedding dresses made of vintage-inspired fabrics to lovely silhouettes, all with unique details that make our gowns a joy to wear. Be it timeless minimalist designs or baroque inspired ones we push creative boundaries to get you the gown of your dreams. Our gowns feature glamorous vintage details, stunning floral embellishments and signature hand-beading and embroidery. This is combined with sumptuous fabrics and perfectly cut silhouettes to make every gown exquisite and comfortable. We deliver to all parts of Malaysia. 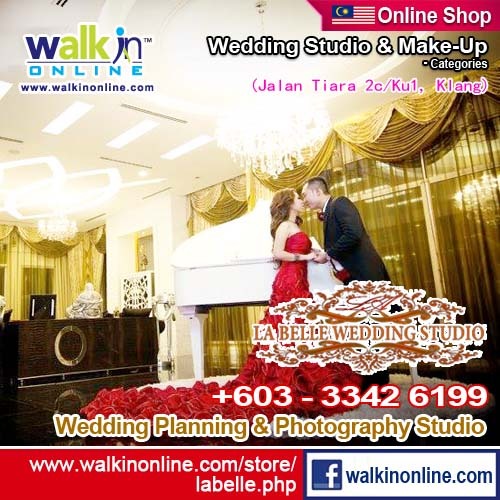 Our fitting / makeup studio is in Bandar Puteri, Puchong. For those who live nearby (Subang, Damansara, Bangsar, Sri Hartamas, Klang or other parts of Kuala Lumpur / Selangor), please call to make an appointment if you'd like to view our gown's fabric, design and cutting quality. Mother of Bride Dresses Customise everything for your dress. View Google Images results above on bridal dresses for your inspiration. We strive hard to keep our dresses affordable. The best deals happen when you get something that is more than worth its weight in gold so to speak. The cheapest deals are not always right. On the other hand, savvy shoppers always work within a sensible budget, so the high end market isn't for everyone either. 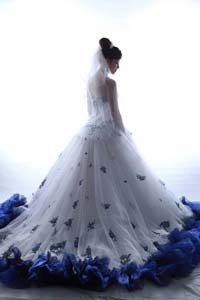 La Belle's gowns are made in Hong Kong by professional artisans. But we have ways to keep prices moderate. We distribute directly from our dressmaker source. We don't buy from 'middlemen'. Nor do we stock hundreds of gowns just for display. Doing that will incur high overheads. And high overheads will force any business to increase prices. What we do have is a small selection mainly for you to test the quality of design, fabric, cutting and texture of our gowns. Smart shoppers are always winners. Minimalist gown designs are in trend, and will sure look good with your bridal photography. Most people who bought these also bought Pixie's Bridal Makeup package. Q: Do you sell ready made dresses? A: No, we only sell unique custom dresses specially tailored to your taste. Q: Do you have any ready-made gowns or dresses for rent? A: No, we don't have rentals. Q: Can I custom make a dress from you and rent it instead of purchasing it? A: Yes, you may choose to custom make a dress and then rent it from us. The price will be marginally cheaper and you get to wear a brand new custom made gown for your wedding or event. Q: How do I make an order for a dress? A: Please email us the dress design of your choice for quotation. We will reply your email within 5 working days. Alternatively, you can also just drop by our studio to get your measurements taken. 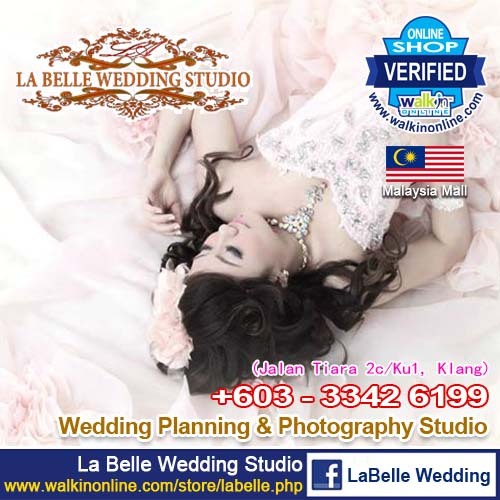 A: La Belle Wedding Dress accept online payment via PayPal for orders made through our Shopping Cart in Facebook. If you wish to make payment via Online Fund Transfer, Bank Cheque or Cash Deposit, please place the order through email instead. Q: How long will it take for the dress to be ready? A: Please allow about 30 - 40 days for the dress to be ready. Production period for the dress takes about 15 days. After that we will allocate an additional 7 days for quality check. During this period, any adjustments can be made to the dress EXCEPT changing the fabric's colour or fabric type. Once any amendments are done the dress will be shipped over to us from Hong Kong for another round of quality checking before it is being handed to you. Q: When should I place an order for my dress? A: We would advice that you place an order for your dress 3 months before your intended date to wear the dress. This will allow enough time for dress fitting sessions to make any necessary changes. Q: I have changed my mind. I want to change the design/colour of my dress. Is this possible? A: We provide a 3 days grace period (starting from the date of order) to make any changes. Any request for changes after this grace period will not be entertained. Q: Does the price inclusive of alteration service? A: Price quoted is NOT inclusive of size alteration. All dresses are made exactly to measurements taken. Gaining or losing weight during production period may cause the dress to not fit perfectly. Additional alteration charges may apply. Alternatively, you can consider a lace up back for your dress which may eliminate the need for size alteration. Q: Do you provide laundry service? A: We will be happy to send your La Belle dress to our trusted dry cleaning service provider at a minimal fee of RM90. Q: What if I am unhappy with the quality of my dress? A: Client's satisfaction are our utmost priority. In the event that (a) the dress does not look nice on you or (b) you are not satisfied with the quality of the dress, we may decide to refund you up to 40% of the dress' total net retail price. All items are carefully inspected by us prior to delivery. Refunds will not be entertained if damages are caused by user negligence. Q: What is your refund policy for damaged goods? La Belle Wedding Dress shall not be responsible for damages caused during shipping. Such compensation shall be claimed by client against the shipping company. We always inpect our dresses before shipping. If possible, we also encourage you to visit our studio to pick up your dress personally. However, in the case of any dispute, we will consider all complaints on a case by case basis. You must request any refund within 3 days of receiving your item(s). The items must be returned with all original packaging and documents. We provide top notch makeover services using high-quality products at competitive rates. Veron Gan, the founder of Pixie Bridal Makeup, is fast becoming a highly sought after makeup artist in KL and PJ(Malaysia), as more and more brides are searching for reliable makeup service with an established brand and reputation to uphold. Fully qualified wedding makeup artist. Only quality cosmetic products used. Bandar Baru Klang, 41150 Klang, Selangor.